During the post-war period, Walt Disney Productions was adrift, without a clear theme for their animated feature films. To support the World War II effort, the studio had created a couple of propaganda films funded by the US government ("Saludos Amigos" and "The Three Caballeros"), a collection of music videos that was modelled about "Fantasia" ("Make Mine Music"), and a two-segment film starring some of the studio's most iconic characters such as Mickey Mouse and Jiminy Cricket ("Fun and Fancy Free"). Unlike other eras of the studio's history, this "Package Era" veered from theme to theme, zigging and zagging in an attempt to build back the audiences that had been lost both at home and abroad because of the conflict. "Melody Time" (1948), directed by Jack Kinney, Clyde Geronimi, Hamilton Luske and Wilfred Jackson, was another aimless Disney zag back toward earlier themes. 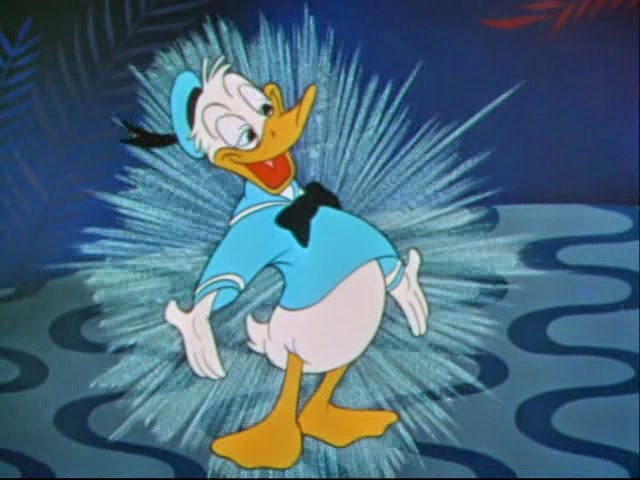 Taking after "Make Mine Music," it was a compilation of music videos with no overriding theme beyond contemporary tunes, and it also touched on "Saludos Amigos" and "The Three Caballeros," with appearances by Donald Duck and his South American friend José Carioca. 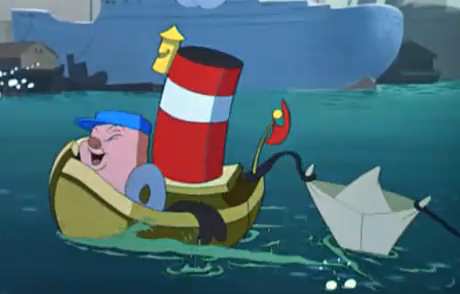 There are also some risqué scenes as in some other Package Era films that show the animators were having a little fun and appealing to an older audience. Overall, it was a success with audiences, but basically a time-filler as the studio regrouped for its return in the 1950s to classic fairytales. Once Upon a Wintertime: Frances Langford sings about two lovers, Jenny and Joe, who have an adventure in a winter wonderland while skating. Bumble Boogie: Freddy Martin and his Orchestra do their take on the Rimsky-Korsakov classic composition "Flight of the Bumblebee," naturally accompanied by animation of a bumble bee bumbling along. The Legend of Johnny Appleseed: Irish Tenor Dennis Day sings the classic story of the pioneer who roams the land and plants apple trees, with the character voiced by Bobby Driscoll. Little Toot: The Andrews Sisters sing about a little tugboat who has difficulty taking after his father in a charming child's tale written by Hardie Gramatky. Trees: Fred Waring and the Pennsylvanians sing the Joyce Kilmer poem "Trees," with the expected animation of nature in the changing seasons. Blame it on the Samba: The Dinning Sisters sing while Donald Duck and José Carioca reunite with the Aracuan Bird from "Saludos Amigos," learning to dance the samba. Pecos Bill: Bob Nolan narrates the story of Pecos Bill, an Old West gunfighter who was raised by coyotes and finds - and loses - love. His girlfriend Slue-Foot Sue attempts to ride Bill's horse Widow-Maker but gets bounced off and winds up trapped on the Moon. Roy Rogers and his Sons of the Pioneers provide the music. As was the case with "Make Mine Music," "Melody Time" is essentially a sequel to "Fantasia." Reworking "Fantasia" every so often with new tunes had been Walt Disney's intent all along, and later claims in the 1990s that he hadn't followed through on that goal (and thus required "Fantasia 2000" to complete that unfinished business) are directly rebutted by these two films. 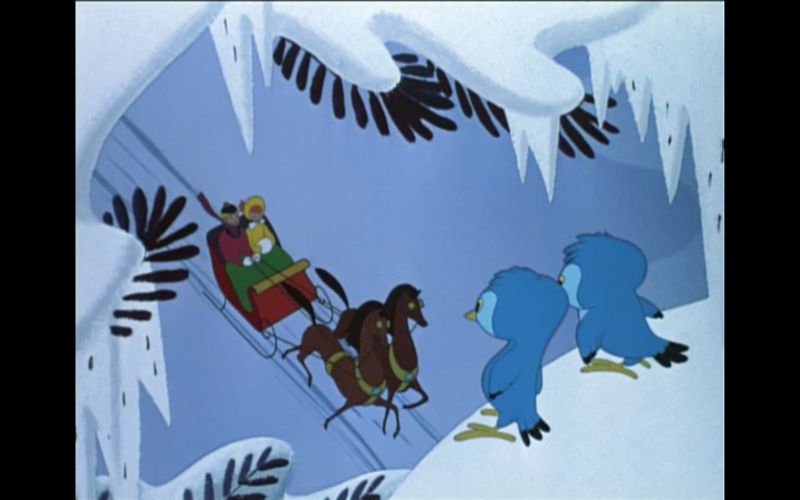 In "Melody Time," the Bumble Boogie segment had been considered for "Fantasia" but ultimately cut. "Melody Time" is thus a sort of low-rent version of "Fantasia" which doesn't reach its heights of enduring resonance, but was more of an immediate crowd-pleaser than the higher-brow (but initially money-losing) "Fantasia." 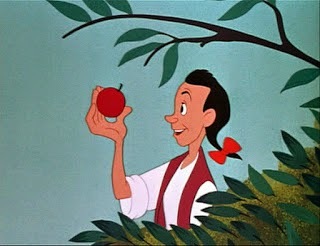 Johnny Appleseed finds an apple. There aren't a lot of surprises in "Melody Time"
The problem for modern audiences is that the music videos in "Melody Time" are like yesterday's newspaper: they were timely and touched a nerve for 1948 audiences, but also purely products of their time. Many of the musical acts are long-forgotten and never achieved any kind of enduring fame that might make revisiting their music now of some historical interest. The tales themselves veer wildly from legendary tales that everyone knows and seem trite ("Johnny Appleseed") to trifles that are fun but would only have resonated with contemporary audiences ("Samba," "Wintertime") to ethereal confections that are so abstract that the focus drifts completely away from the animation to rather pedestrian musical numbers ("Bumble Boogie," "Trees"). It is as if Walt Disney had a bunch of projects that he didn't know what else to do with and stitched them together and threw against the wall, hoping that, even if you didn't like all of them, you'd find something in there to make you buy a ticket. That is not to say that the quality is sub-par. In fact, as in all the 1940s productions, the animation is superior. You certainly can't fault the musicians. Roy Rogers and the Andrews Sisters are always worth watching, and everyone is at the top of their game. However, if you are hungry for a hamburger and someone cooks up a truffle for you, no matter how good it is you'll still probably not be too satisfied. One could go collect music videos from the 1980s, for instance, and stitch them together and produce the same reaction in today's viewer. It's the Disney version of fast food, which was great while it was hot and fresh, and not so much now that it has sat around for a while. 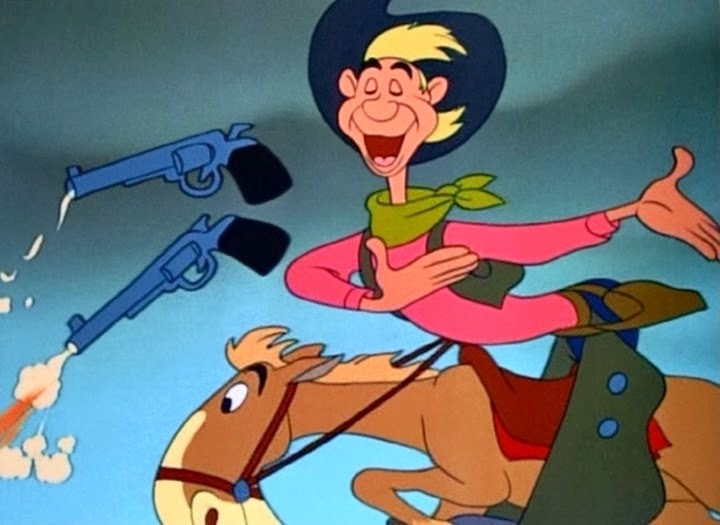 There's also the issue of consistency, with stories obviously aimed squarely at children ("Toot") alongside some that have obvious adult sexual references (in "Pecos Bill," his guns spontaneously pop out of their holsters and shoot as he kisses his lover). 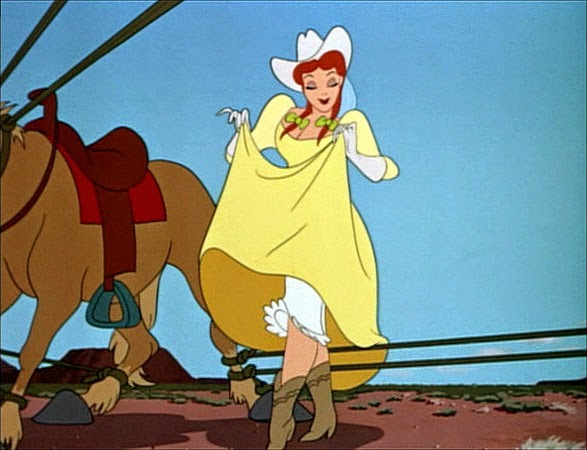 "Pecos Bill" was viewed as a children's favorite at the time (probably because of the presence of children's show star Rogers), though, so many people may have missed, ignored or secretly enjoyed the painfully obvious adult metaphors and graphics. Some top talent that would later explode in popularity was working behind the scenes as the fading 1940s stars took center stage: Mel Blanc and Thurl Ravenscroft (later famous for "You're a Mean One, Mr. Grinch") provide sound effects in "Toot," while the Andrews Sisters take their final film bow with a rousing performance. Times were changing, and "Melody Time" is best looked at as a time capsule at a turning point in American culture, when the big bands and swing music were just about to recede while television was on the verge of changing the entire dynamic of the entertainment industry. "Melody Time" has great individual segments. If you pick and choose the ones you want to watch and ignore the rest, you'll enjoy it more much more. That, in fact, is what happened in the 1950s, with various segments released individually. 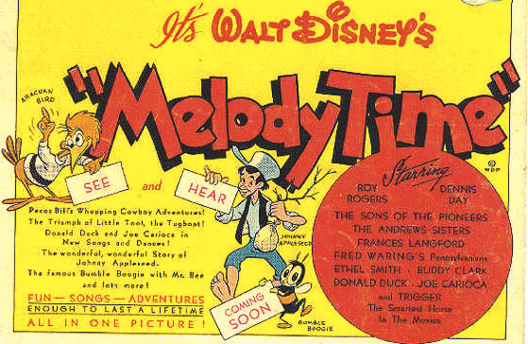 Taking it all at once, "Melody Time" can be a bit of an overdose on 1940s culture. However, "Melody Time," "Make Mine Music" and all the rest of the Package Era films are currently available on DVD, so art from that decade still manages to entertain. Below is the trailer for "Melody Time."